Bodhisattva Cundi is a being of great spiritual status. The Bodhisattva is said to have been the true manifestation of the World Honored One entering into the Samadhi of Spiritual Power of Transformation of Ocean and Space. 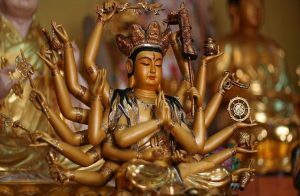 The Bodhisattva is also known as the Cundi Guan Yin. While the Bodhisattva is less well known in Tibetan Buddhism tradition, She is venerated in East Asian esoteric Buddhism or Tangmi. Esoteric Buddhist sacred teachings commonly come from the later period of Indian Buddhism, from the seventh century onwards. The word Cundi literally translates from Sanskrit as ”Supreme Purity.” She is all-mighty full, and her Tantric epithet is the Most Victorious Vajra, or Subjugation Vajra. Being the mother of all the deities of the Lotus class, she is therefore known as the Buddha Mother, the Mother of Seven Kotis of Bodhisattvas and Buddhas. The Bodhisattva regularly appears with 18 arms and three eyes. Furthermore, She is adorned with a jeweled crown which is mounted with a figure of a manifested Buddha. The color of her physical body is yellow, adorned with all kinds of jade and pearl ornaments. In addition, the Bodhisattva wears pearl and jade arm ornaments, and wears a white celestial garment. She is usually depicted seated on a lotus throne, her 18 arms, with the original 2 hands forming the Root Mudra (also known as the Mudra of Life), hold different implements, in a clockwise direction: a precious vase, a wish- fulfilling banner, a lasso, a bathing vase, a lotus, an eight-spoked wheel, a conch, a vajra scepter, a wisdom chest, a head-dress, a heavenly fruit, a hook, an axe, a wisdom sword, mala beads (for counting the mantra), and the Fearless Mudra. The first sacred textual source of the Bodhisattva is the Karaṇḍavyuhasutra, a Buddhist sutra centered around the Chenrezig (Bodhisattva Avalokitesvara) that introduced the popular six syllable mantra oṃ maṇi padme huṃ. This sacred text is first dated to around the late 4th century CE to the early 5th century CE. The Bodhisattva is also featured in the Cundi Dharaṇi Sutra, which was translated 3 times (at least) from Sanskrit to Chinese in the late 7th century and early 8th century by the Indian esoteric masters Divakara (685 CE), Vajrabodhi (Indian Buddhist monk – 723 CE), and Amoghavajra (8th century). His perfection of impartiality to all. His unfailing thought to salvage sentient beings. His unflagging zeal to salvage sentient beings. His unceasing desire to salvage sentient beings. The unceasing wisdom to salvage sentient beings. Revealing perfect wisdom in deed. The principle of the powers of deliverance. Perfect knowledge of the future. Revealing perfect wisdom in thought. Perfect knowledge of the past. Revealing perfect wisdom in word. Perfect knowledge of the present.